Fortnite is about to get a quadruple dose of rocket launcher action with the upcoming Quad Launcher weapon. Fortnite players who like to stay on top of the latest news likely heard about a rocket launcher that was leaked through data mining efforts a few weeks ago. That weapon was the Quad Launcher, and it looks like it's about to land in Fortnite Battle Royale. 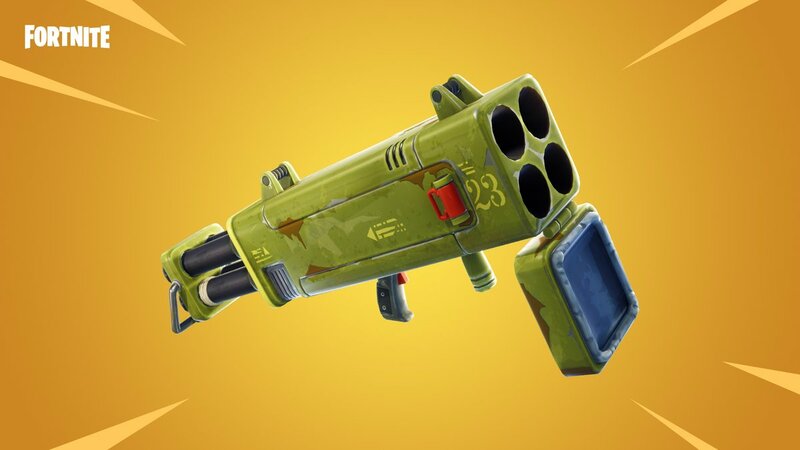 As revealed in-game through the Fortnite news page, the Quad Launcher weapon is "coming soon." The news post provides only the barest details about the weapon, saying that it allows players to "quickly fire up to 4 rockets to blanket an area with explosive damage." From what we can tell so far, the Quad Launcher in Fortnite Battle Royale should be essentially the same weapon as the Quad Rocket featured in Save the World, though it's possible that the crew at Epic Games will still need to tweak a few parameters before it's ready to make its proper Battle Royale debut. Still, there's little doubt players will jump on the chance to bombard their enemies in a hail of fire and destruction. There's little doubt that the Quad Rocket will be able to turn even the most elaborate structures into mincemeat, and quite possibly take out entire groups of enemies if used properly. We're still waiting to hear more about the Quad Launcher from Epic Games, most notably a date when players will finally be able to find it in-game. It will likely be added alongside a future patch, so be sure to keep checking by Shacknews' Fortnite home page to stay on top of the latest news and Season 6 developments. Oh man. This is going to hurt.